Well, he doesn’t fear embarrassment, anyway. I wanna know how he got that radio flyer to fly like that towards the minininjerks. Oh, I get it! It’s a Volkswagen Beetle! 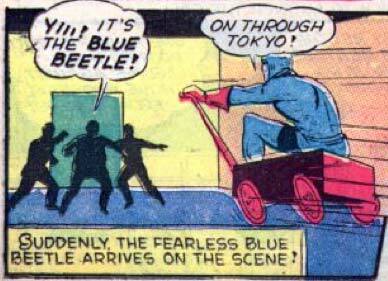 Take down those Japanazis, Beetle!! so your telling me that if i dress all in blue and sit in a wagon i can run people over? AND not only that but be called a superhero TOO??? but, yeah, it’s a touch silly! Y’know, maybe we’re being too hard on him. I mean, if I was a super-strong hero about to beat up on a bunch of regular joes, I might want to inject a little fun into the situation too. If you were playing a GTA game, and a little red wagon was a mode of transport you could use, would it not be terribly tempting to use it to bowl people over?